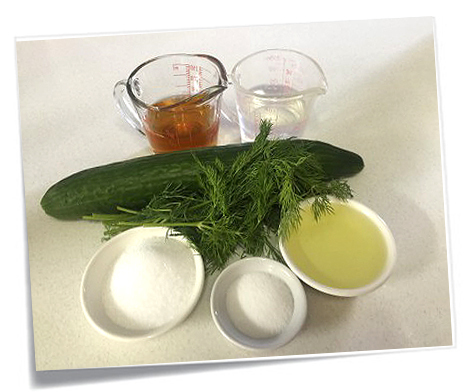 This Dill~Cucumber Salad recipe is so easy and simple to make with just a few ingredients. It is very refreshing and delicious in summer and equally as good during the winter months. An excellent salad to accompany those tasty Finnish meatballs, meatloaf, smoked salmon and as a side dish for any meal. I brought the cucumber salad to my neighbour’s place. We had this salad with smoked salmon, capers, lemon, cream cheese and rye crackers. 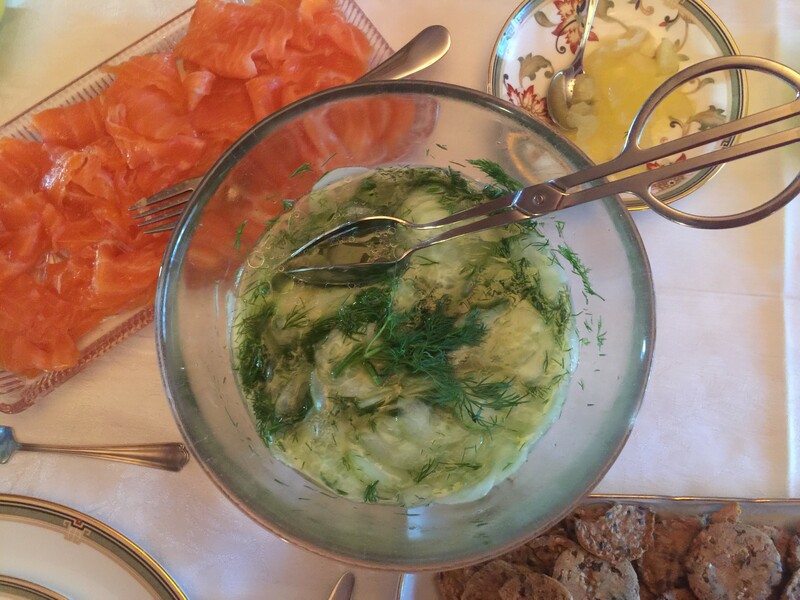 The cool cucumber salad cuts the richness of the smoked salmon in a most pleasant way. Since we are all of different nationalities, we discussed and critiqued other country’s versions of cucumber salad. The election was over after we counted the votes. My Dill~Cucumber Salad won! Chilly Dilly cucumber will not be making any speeches. However, his winning secret is in the dill ~ a subtle, delicious flavour that really enhances the cucumber. 2. Add the dill and cucumber slices. 3. Refrigerate for several hours to let the flavours meld. TOP SEVEN ALKALINE FOODS: The cucumber is one of the most alkaline foods (#3) that you can eat. Combined with the effect of the apple cider vinegar, it will help to make you body alkaline or at least closer to a neutral pH when you are eating acidic proteins. Both meat and even fish and chicken are acidic. 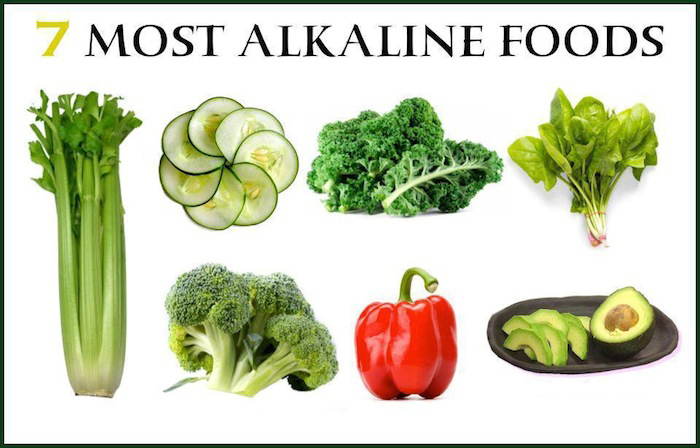 Your body wants to stay alkaline or at least closer to a neutral pH to stay healthy along with fighting off and prevent disease. Eat your veggies! BONUS: This is a very tasty cucumber salad recipe! Until you make this cucumber recipe perhaps for the first time, you will know what you have been missing! My taste testers (friends) tell me all the time. You will make this salad again and again! This salad contains 2 tablespoons of healthy oil, which is my variation to the traditional Finnish cucumber salad. Not only does it prevents the cucumber slices from sticking together it is so good and healthy for you. If you recall the true story about Lorenzo’s oil. (actually containing two specific long chain fatty acids, isolated from rapeseed oil and olive oil) will know the miracle of oils. We don’t know everything about food/medicine. Some people have a shot of oil in the morning to start their day! A-M-A-Z-I-N-G!!! When I made this cucumber salad I was so impressed by the flavour. A simply splendid recipe! Thank you! My mother made this salad every day at summertime , but she didn´t use oil. The oil is not traditionally used in Finland for the Finnish cucumber salad. Dr. John La Puma and other sources have established that a healthy oil in any salad is good for you. The oil makes the nutrients in vegetables more body ready. It unlocks the nutrients to give you the maximum absorption possible. Thanks for you comments and thanks for reading! Noboby used oil with their cucumber slices about 1950-1960. We used no oils at all. You are right. I have had this salad many times with no oil growing up as a kid at home. And, it tastes great! Potato salad with no oil is still one of my favorite salads. My version of the cucumber salad supports oil as a healthy “new” cucumber salad. There are so many versions as you may guess. We are learning more about foods that are catalysts for each other and make changes to promote good health and taste good at the same time! Your cucumber salad sounds delicious and refreshing! I like the idea of adding the dill. The dressing sounds so good, too! Thanks for sharing all the health facts. I enjoy reading them. I do appreciate your kind comments. Your site is stunning and the photography showcases your talent.